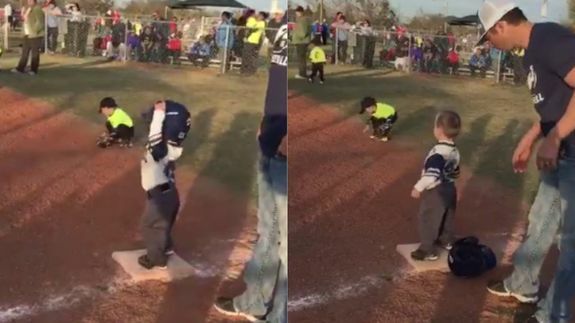 Little t-ball player finally makes it to first base, dances accordingly - trendistic.com: ever tried. ever failed. no matter. try again. fail again. fail better. This little athlete celebrated landing on first base with a home run of a dance routine. Twitter user @selenaa04 tweeted a video Wednesday of her four-year-old cousin, a tiny t-ball player, celebrating after he finally hit the ball and made it to first base. His moves would make even Beyoncé jealous. Life goal: dance so hard your batter’s helmet falls off. The little slugger’s mom even set the epic dance sequence to “Turn Down For What” — with unsurprisingly hilarious results. Turn down for sports, that’s what.